Used Gondola Shelving. New Retail Display Aisle & Wall Shelves. You can immediately differentiate your store from those of your competitors with a reasonable investment in new gondola shelving. Gondola shelves determine the position and prominence of your most important products, making it easier to catch the attention of your customers. No doubt you are looking to run specials this Christmas Season, and maximizing your ability to showcase and move large quantities of seasonal items can play a crucial role in your success this year. They key to remember is space management and planning. More can be done with less when you understand the two basic types of gondola shelving that are available and how to combine display units from both categories to create new layouts and presentations. 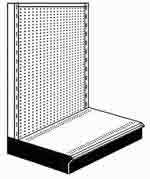 Double sided gondola shelving, also known as “aisle shelving” runs vertically through the center space of your floor plan and holds products in shelves extending from either side. This is why it is also called “aisle shelving” because it creates aisles between the display units. Grocery stores depend on this type of shelving more than any other, because this is where they store the majority of their products. Single sided shelving is also known as “wall shelving” due to the fact that it is used to convert otherwise unused wall space into merchandising space. 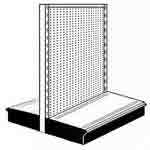 However, this type of shelving is also used to create end caps. If you are the owner of a small, privately held store, using wall shelving for end cap displays can often double your merchandising power by placing products immediately within view of the front door. Again, planning your layout is key to getting a return on investment in gondola shelving. If you are too busy to do this, call our office and send us some pictures of your store. We will do the rest. Easy Rack will help you customize any and all of the units you order today to fit your exact space management needs. It helps if you have photos or a blueprint of your store that you can email or fax us so we can help you identify just what you need, and where. Buying the right type of gondola shelving is a key element to loss prevention. Regardless of the final components we propose for your layouts, there are a few basic parameters for gondola shelving we recommend to every client. For example, our experience servicing the retail market has taught us that a horizontal length of 48” is the ideal unit of measurement on which to build a display. We have also discovered over the course of time that retailers do best with gondola shelves that are no more than 72”-84” in height. This gives them plenty of room to stock even the largest of items (one individual shelf can hold up to 350lbs in weight) and still leave enough room for cameras, mirrors, and store employees to monitor loss prevention while shoppers are browsing. Visibility keeps everyone honest.